The concept for the E-Jets E2 cabin interior has received the prestigious Crystal Cabin Award in the “Industrial Design and Visionary Concepts” category. The prize was announced at the annual Aircraft Interiors Expo in Hamburg, Germany, by the Crystal Cabin Award Association in recognition of outstanding innovation in the field of aircraft cabins. The E2 cabin concept was developed in partnership with UK design firm Priestmangoode. The design incorporates a series of innovations and differentiates the E2s, the second generation of its E-Jets family of commercial aircraft, from its competitors by emphasizing “individual territory.” The design philosophy promotes increased personal space for passengers and their carry-on luggage, and is based on a modularity concept that brings greater flexibility for airlines to reconfigure the cabin. “Congratulations to all teams that worked so hard on the concept and for accepting the challenge to do something different, innovative and, above all, valued by our customers,” said Luís Carlos Affonso, Senior Vice President & COO, Embraer Commercial Aviation. One of the more significant innovations in the interior is the redesigned overhead bins which will be about 40% larger than those on current-generation E-Jets. The bins allow every passenger to stow one typical roll-aboard bag (the IATA maximum recommended size) in a wheels-first position. In First Class, the new staggered individual seat option provides 50 inches or more of leg room without compromising total seat count. This configuration introduces a higher standard of comfort and space on a single-aisle jet that is traditionally found only on much larger airplanes. In Economy Class, the E2s retain the advantages of two seats on each side of the aisle for greater passenger comfort faster boarding and deplaning. The 18.3-inch wide slim-type seats – among the widest in the industry – provide more leg room for passengers. New individual control panels for lights and air-conditioning (the Passenger Service Unit – PSU) enhance personal space with more ergonomic and intuitive controls that were inspired by the automotive industry. The windows have been redesigned to create the feeling of a larger cabin with abundant natural light. 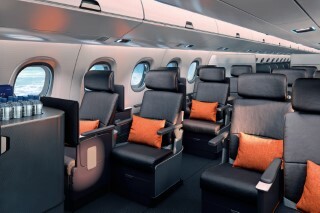 The E2 cabin will have options for Wi-Fi internet connectivity and individual screens for in-flight entertainment, among other amenities. Another key requirement in the development of the new interior was easy reconfiguration. A modular approach was adopted to reduce transition lead time and costs. Leasing companies are playing an increasingly important role in aviation and several features were added to the interior design to address their specific requirements.